Three new tires for farming applications are available from Alliance. * The Galaxy Muddy Buddy skid steer tire. "Each of these tires brings a valuable tool and an important choice to America's farmers," says Seth Walters, Alliance's vice president of marketing and supply chain. "With bigger, faster equipment and increasing awareness of the damage that can be caused by soil compaction, we're seeing a clear demand for increased flexion, or IF, tires across the country and around the world," he says. "We've introduced the two sizes that can put the benefits of IF onto the greatest number of farms – the IF480/80R50 that fits a wide variety of high-horsepower tractors, and the IF380/90R46 row crop size for high-speed, self-propelled sprayers." Increased flexion, or IF, tires are the product of sophisticated engineering and materials to add extra strength and flexibility to the sidewalls of radial tires. The result is a tire that can carry a given load at 20% less air pressure than a standard radial tire of the same size, or carry 20% more load at the same inflation pressure as a conventional tire. For spreaders, tractors outfitted for construction projects or mowing work, or for equipment operating on sandy or snowy ground, the Alliance Multiuse 550 radial is tough to beat, says Walters. The 550's lugs are divided into rugged blocks that optimize the rubber-to-void ratio for excellent traction, better road-ability and long life in environments in which repeated turning on hard surfaces can scrub away tread lugs. Steel belts and rugged compound ensure durability, says Walters, and a flat footprint reduces compaction and rutting. The Muddy Buddy's sharp shoulders provide extra grip in soft or slick conditions, and the shallow lug angle delivers better traction and more surface area. Deep tread and durable bead construction make the Muddy Buddy a rugged, long-lasting tool for farmers and ranchers. 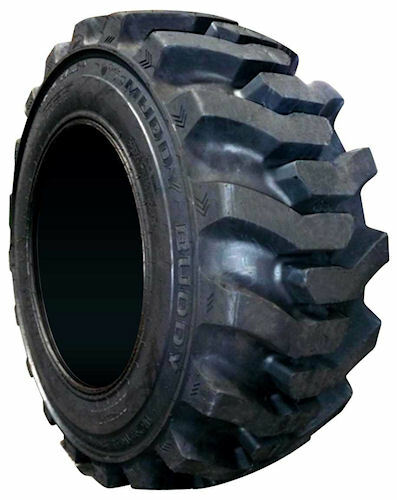 For more information, visit www.agtire.com.